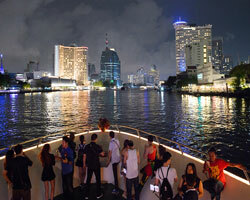 Bangkok passenger boat operator Chao Phraya Princess is set to take delivery of its seventh dinner cruise vessel – aptly named Chao Phraya Princess VII. As Ship & Boat International eNews was going to press, the vessel had just been completed by Central Thailand-based builder MitsDecisions Company Ltd, and had commenced her outfitting phase in the Thai capital. Like her six previously delivered sisters, the vessel will undertake day and night cruises along Bangkok’s Chao Phraya River, serving up traditional Thai food, buffet-style, as she passes landmarks including the Wat Arun Buddhist temple and the Grand Palace.Chao Phraya Princess is managed by the Tristar Floating Restaurant Co. Ltd.
Chao Phraya Princess VII can accommodate up to 492 diners, plus five crew members and 17 service staff, across her 55m x 12m, two-deck layout. The cruiser boasts a 15-person kitchen, although 90% of the cooking will take place on shore, and will offer live music entertainment during its cruises. Her engine rooms are located port and starboard, each containing a single Cummins KTA19-M engine rated 447kW at 1,800rpm. These engines drive 1.37m propellers via DMT260 HL gearboxes with 4.08:1 ratios, supplied by South Korean manufacturer D-I. Although the Chao Phraya Princess sisters are intended to operate at relatively slow speeds, the vessels can attain 12knots when pushed to the max. Each engine room also houses a 150kW Cummins 855 generator. MitsDecisions specialises in building small-and medium-sized vessels up to 85m in length, and claims that the layout of its facility permits it to work on at least four newbuilds simultaneously.